"In an era with explosive information technology and ubiquitous smartphones, railway workers need to keep pace with society and better serve passengers during the travel rush." Two workers are on their way to deliver meals to passengers at West Jinan Railway Station in east China's Shandong Province in this file photo taken on February 13, 2018. Ma was traveling from Beijing to Guangzhou on a high-speed train and enjoying freshly cooked spicy fish head and stewed pork, typical cuisines of his hometown in Hunan Province. "All I did was to take out my phone and make an order, and the meal was served upon the train's arrival [at Changsha station in Hunan]," said Ma. "I'm so glad to have a taste of my home on this long and tiring journey." China is in the midst of its travel rush for the Chinese New Year, the most important time of the year for Chinese families to get together. Around 2.98 billion trips are expected to be made during the 40 days starting February 1 around the festival, including 390 million trips by train, up 8.8 percent on last year. With their smartphones, Chinese people on trains will no longer have to eat instant noodles, ham, sausages and box meals, as food delivery services have gone aboard high-speed trains. From July 2017, 27 major railway stations across China launched a pilot on-demand food delivery service for high-speed trains passing through the stations. Meal upgrades are not the only progress brought by smartphones during the travel rush. At waiting rooms of Beijing Railway Station, passengers waiting for their trains can be found shaking their smartphones. Within seconds, a service webpage shows up on their screens, with the train schedule, wheelchair leasing, and lost and found services available. The software imbedded in the social networking app WeChat can also lead passengers to the right waiting room. 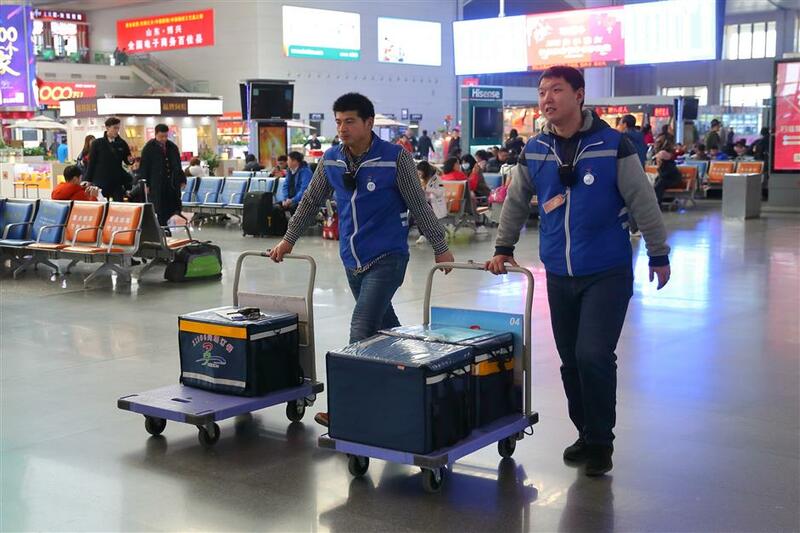 "The smartphone service has saved passengers from turning to a station worker for help and improved efficiency for our services," said Ma Jianfu, a publicity manager at Beijing Railway Station. At Beijing West Railway Station, railway workers have applied for facial recognition for ticket checks. The gate allows passengers to pass through automatically if their faces are recognized as the same as pictures on their ID cards. "It needs only three to five seconds for each passenger to enter," said Song Tingting, a station staffer. According to the China Railway Corp, 70 to 80 percent of train tickets are sold online, with nearly 10 million tickets sold at most in a day. Ma from Beijing Railway Station said technology has helped improve railway services. "In an era with explosive information technology and ubiquitous smartphones, railway workers need to keep pace with society and better serve passengers during the travel rush," he said.